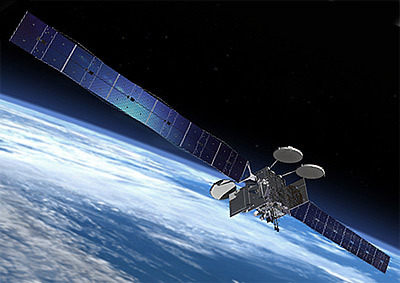 ViaSat 2 high capacity broadband satellite for ViaSat Inc.
Boeing was selected in May 2013 to provide the satellite and payload for ViaSat 2. The new spacecraft is scheduled to launch in 2016 and is expected to provide more than 15 years of service life. It employs Boeings space-proven BSS-702HP platform and high-capacity Ka-band spot beam technology to ultimately service more broadband users at faster data rates than any previous satellite. With 350 Gbps it has about 2.5 times the capacity of ViaSat 1. ViaSat 2 will cover all of North America, Central America and the Caribbean, with coverage including the U.S. East Coast seaboard commercial air routes and the main air and maritime routes between North America and Europe. The coverage area is seven times the size of ViaSat 1’s coverage. The satellite was booked on SpaceX's Falcon-Heavy (Block 5) rocket for a launch in late 2016, but was moved to an Ariane-5ECA rocket in 2017 due to schedule uncertainies. During testing on orbit, an antenna deployment issue was identified, which causes some spot beams to perform differently than they did during ground testing. This problem limits the downlink to downlink to ~260 Gbps.